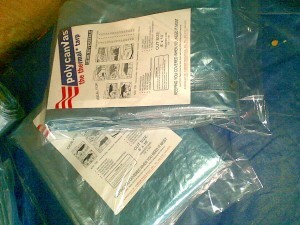 Tarps – Fabrimetrics Philippines Inc.
Our product, Polycanvas ™, has been in existence since 1993. We pioneered and introduced polyethylene (PE) laminated sheets in the Philippines. Our tarp is made up of high tensile, 1000 Denier strands of High Density Polyethylne (HDPE), wooven together to form a 10 x 10 strands per square inch matrix. The wooven HDPE fabric is then laminated on both sides with Low Density Polyethylene (LDPE) to provide UV resistance and water proofing. Polycanvas ™ is sold in all hardware chains nationwide. We have been in this business for more than 22 years and we have been exporting tarps to the USA, and Japan. 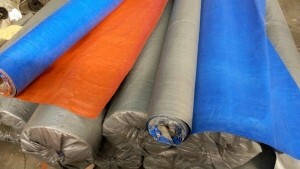 As an exporter of tarps , our quality and price are proven to be the best in the world. Colors available: Blue / Silver, Blue/Orange, others colors are as per order basis. 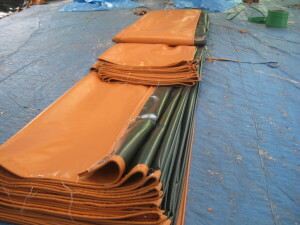 We also make PVC tarps, Lona, and, Tolda as we call it. 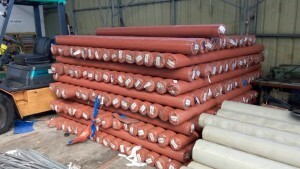 These are heavy duty tarps made out of PVC with nylon reinforcement sandwiched in between. We custom make any size and any color as you want. We can make extra large covers for different applications. We take pride in our quality and competitive price.